A globally-trusted producer of delicious foods, the Kraft Heinz Company is one of the largest consumer packaged food and beverage companies in North America and worldwide. They manufacture food products such as cheese, refrigerated meals, beverages, meals & desserts, enhancers & snack nuts. They sold their products primarily to supermarket chains, wholesalers, supercenters, club stores, mass merchandisers, distributors, convenience stores, drug stores, value stores, and other retail food outlets. Their subsidiary, H. J. Heinz Company Australia Limited, is engaged in food processing and marketing branded grocery products in Australia. Based in Southbank, Australia, they provide beans and pasta, soups, sauces and dressings, vegetables, baby food, chicken, desserts, and ready meals. 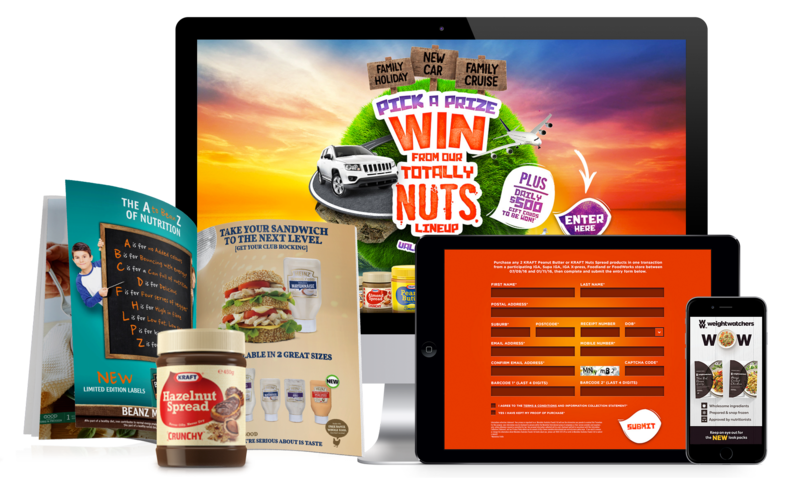 Our team helped KraftHeinz with their marketing promotional activities through web development and SMS blasting, creation of POS materials, packaging designs, content copywriting for various products and advertising across their many products – Weight Watchers, Kraft Nuts, Greenseas, Heinz Ketchup & Mayo among others. We created interactive design for their Weight Watchers Online webpage that enabled their site visitors to consume content through any device of their choice and preference, anytime. We also provided them an order confirmation page and shopping cart design which increased KraftHeinz' customer engagement. With the now fast loading webpage, easy form filling features and effective basket summary reminder for users customers don't have to leave the checkout page without purchasing any Kraft Heinz products.